A host of award-winning authors including Sarah Waters, David Almond, Philip Reeve and Malorie Blackman are calling on the government to make it a legal obligation for every school to have a library. Kevin Crossley-Holland who is the new president of the School Library Association and who has won both the Guardian Children's Fiction Prize and the Carnegie Medal says "If only the government would full-bloodedly espouse and implement this mission, they will be making a profound statement about their commitment to educational standards, an to what it actually means for a scoiety to be civilised. Here's a common cause, and an investment in the future, if ever there was one"
Viviane Schwarz was at the CILIP Carnegie Greenaway award ceremony last week with her shortlisted book, There are no cats in this book. As she said, she was in great company, and you've no doubt already heard that Patrick Ness (writer) and Jim Kay (illustrator) uniquely scooped both awards for their book A Monster Calls, based on an idea by the late Siobhan Dowd. However, Viv did extremely well to get on the shortlist as the competition is so fierce, so she deserves to be hugely congratulated! Luckily for us, she gave me the artwork for this book earlier in the year and there are still a few wonderful pieces remaining. For further details of the pictures please email Linda or visit her website. The Caucus Race: Join Alice and other Wonderland characters in the famous race where everybody wins! Free. 8 July Merton Fields, Oxford. The three winners included Annabel Pitcher for My Sister Lives on the Mantelpiece (Orion/Indigo), which was also short listed for the Carnegie. Judges: Frances Fyfield, Mike Gayle, Fay Weldon. Bring your favourite cartoon character to life by making it into a puppet. We will work with you for the day to make your own Bart Simpson, Disney Princess, Superhero, or Manga star puppet. Bring a picture of your favourite one with you or we’ll be prepared with ideas to get you started on the day if you can’t decide. Working with our expert puppet makers we’ll help you make your puppet and teach you how to use it finishing the day with a short performance using the puppets you have made for your friends and family! Take your puppet home with you at the end of the day. The School Library Association (SLA) is delighted to announce that from June 10th 2012 the distinguished and award winning author Kevin Crossley-Holland will take up his role as President of the SLA. Following on from the success of our IBBY Christmas card (featuring illustrations by Jan Pienkowski, Michael Foreman, Jane Ray and Shirley Hughes) and in response to requests for a notelet card, we are pleased to announce a new card by Anthony Browne. 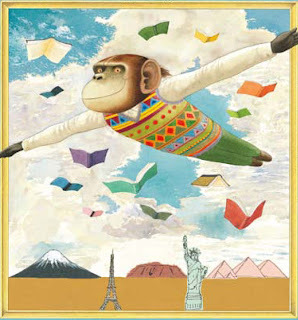 The illustration on the front of the card features Anthony Browne’s well-known Willy character flying over the world surrounded by open books. The inside of the card is blank to write your own message. Cards are available in packs of 10 at £6 (including postage and packing). Full details are available on the order form. Congratulations to Chris Westwood on winning the North East Book Award 2011 with Ministry of Pandemonium and to Tom Avery for being shortlisted with Too Much Trouble. Both books published by Frances Lincoln Children's Books. The North East Book Award is one of the longest running regional book awards. Students from 50 schools in the region judge the awards each year with the winner of the teenage category being announced in January and the junior category in May.